Oh no, I’ve lost a chicken! 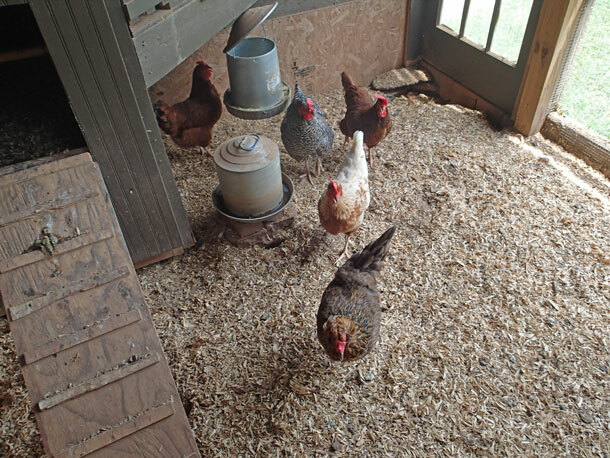 It’s our first house sitting gig of the summer and Peter and Tova and the girls will be back from Italy in two weeks and they’ll be short one egg-laying hen. Where is she?!? It’s early June. We are back in Cabbagetown, where our pet-sitting calendar is lining up. We have houses to sit through August. Sometimes, more than one at a time. Now some of our charges are old. Their owners wouldn’t be surprised to return from vacation to find that their beloved pets have passed on. But we’re not supposed to just LOSE them. Oh, there she is pecking around behind Peter’s man-barn. Need a taller fence. 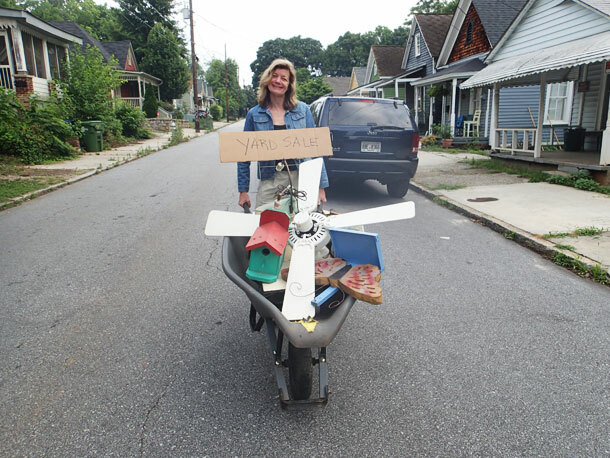 It was a whirlwind summer for us in Cabbagetown. We sat in nine houses, tending eleven cats, eight dogs, five (count ’em, five) chickens, and one parakeet. We used a special system on our tablet’™s calendar to keep track of it all: people’s names told us whose house we could sleep in, pet names told us who we were feeding and pooping. Two or three trips to Lowe’s or Home Depot each day. Lots of work to do. The car was never on auto pilot. With all of the one way streets in Cabbagetown you enter the neighborhood differently depending on where you are headed. It was a milestone summer. My sweetheart, Duwan, turned 50. We sold our house and officially became “free range” people. We plan to buy a camper van next year to make traveling on “the dirt” easier. 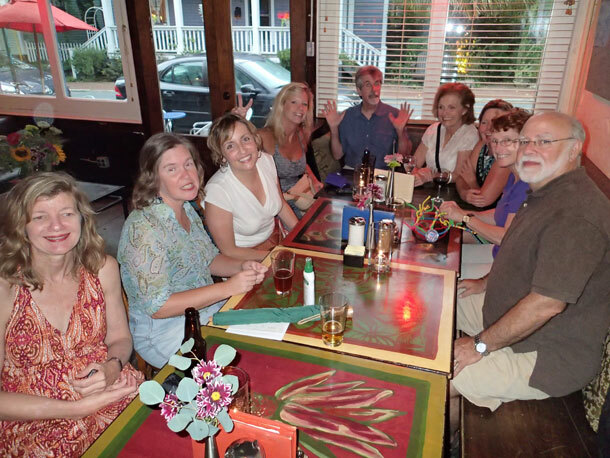 Start of the Duwan’s 50th birthday celebration – inside nice and dry before the rain. It was a great summer for music. We saw Bobby Bare Jr., The Old Fourth Ward Klezmer Band, Grinder Nova, The Iguanas, The Wham Bam Bowie Band, Wasted Potential, The Psychedelic Furs, and of course, Slim Chance and the Convicts. I had a very enjoyable open mic night at Eddie’s Attic. Our friend Karen took us to Montgomery where we visited the Hank Williams museum. And we got to play bluegrass in the Georgia hills when niece Ariadne visited from New Orleans. There is much to celebrate here in C-Town. Helen thinks we need a party to commemorate the fact that mojitos exist. The Reverend Dechant finishes his shark sculpture? Party. Duwan’s 50th? Rainy party in the Whisper Garden. Dr. James has button accordion? Party. Heck, we even have a Tunes From the Tomb party at Oakland Cemetery (after the morning pre-party at Dan and Alicia’s). 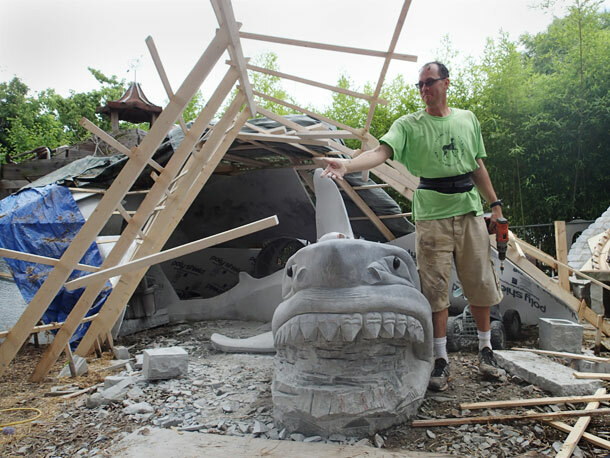 Cabbagehead, David Dechant has spent the last two years carving a life-sized shark out of granite in his front yard. On the Forth of July we attended the official unvailing party – Shark Attack! What else? We stay at Dian and David’s tending their huge dogs Zola and Gus. Gus looks fierce, but he is very “gentle.” He always greets you with a stuffed toy in his mouth. He’s scared of riding in the back of the truck. David pets him and talks to him to get him to eat. David has a surprise for Dian. While they are gone, neighbor Marshall will come remove a wall in between her dining and living room. Marshall asks me “Do you know anything about electricity?” I decide he needs my help. With the circuit breakers off, and armed with crowbars and hammers, we attack. Dust and splinters fly. We make a lot of noise tearing down the wall and piling the pieces outside. Poor Gus cringes in the farthest corner of the yard. He wasn’t happy for days, but Marshall and I had a blast. 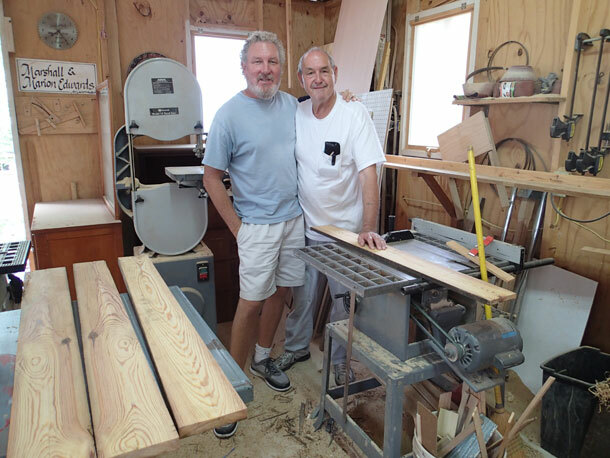 Greg and Marshall in Marshall’s workshop. Can you be a Cabbagehead and homeless at the same time? I don’t know. But here is an example of how disorienting it can be to try. The first two songs of my open mic at Eddie’s Attic went well. People listened. They laughed and sang along at all the right times. And the emcee gave me a big smile and handshake as I walked off. Now, I do novelty songs. They are fun, but they are not open mic finalist material. So I sat back, relaxed, had some more beers and enjoyed an excellent string of performers. I was very surprised later when someone came into the bathroom and told me to get up front quickly, I was a finalist. I went up to the stage trying to remember the intro and words to a song I wanted to play. Then the emcee, who had been stalling for a couple of minutes, started asking me all these confusing questions. Where was I from? Well, I don’t have my tablet so I’m not really sure where I’m staying today. I figured “Cabbagetown” was a safe enough answer. Well, he knew Cabbagetown. What street? I picked Tye Street. It wasn’t exactly true, but we had owned a house there earlier this summer. Did I know Powell Street? Oooh, easy answer, “Yes.” (Actually, that’s where we were staying now.) Did I know David Thayer and his house on Powell? What I thought was: everyone knows David and his crazy old wonderful C-Town home, and his pair of Great Danes and his cat who feeds on squirrels. Duwan and I were parked on Thayer’s porch a couple of nights ago along with neighbor Laura and some guy who was the lead singer of a band called Deer Hunter that was going to Poland in a few days for a single concert, and the conversation turned to a long discussion about which prescription drugs mixed best with which non-prescription drugs and I could hardly follow it and, oh, I probably shouldn’t share all of this with the Eddie’s Attic audience. So I just smiled and said “Yes, I know David.” I forgot the intro to my song. I raced through it and got a smattering of applause from people who were probably as bewildered as I was. Now most of you folks know where you’re from. I’m glad for you. But please quit confusing folks like me with all your penetrating questions. When it came time to leave the ‘hood I looked around and thought of all the rooms with fresh paint jobs, the doors that opened and closed easily now, the refinished doors, and the finished porches, decks and closets. I hope we left Cabbagetown in better shape than we found it this summer. And I look forward to another summer of pet watching, projects, and porch sitting. Anything goes in Cabbagetown. 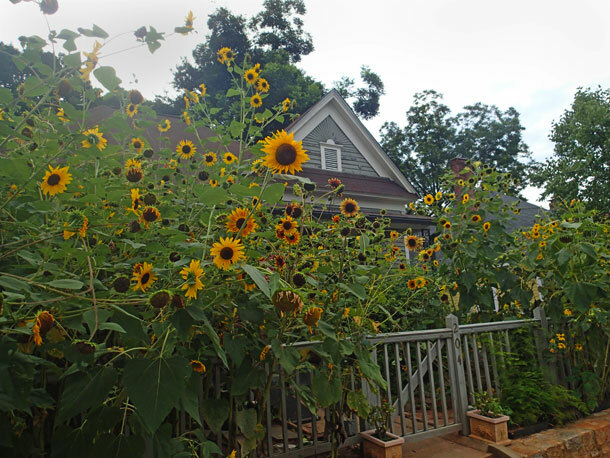 You can carve a giant granite shark in your front yard or grow sunflowers taller than your house. 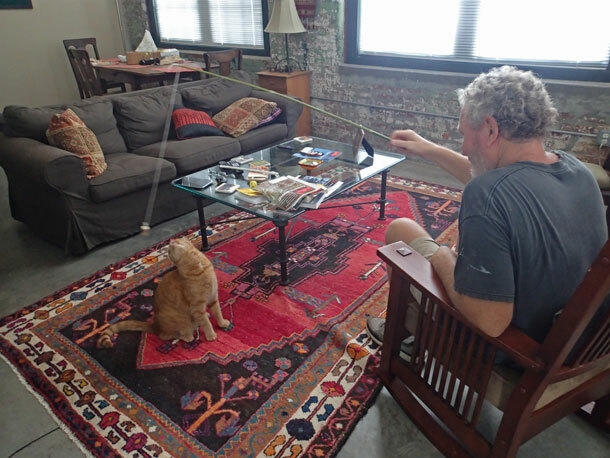 Greg made toys for the cats of Cabbagetown our of bamboo, fishing line, corks and a bit of an old shirt. They were a hit! Enos is completely transfixed. 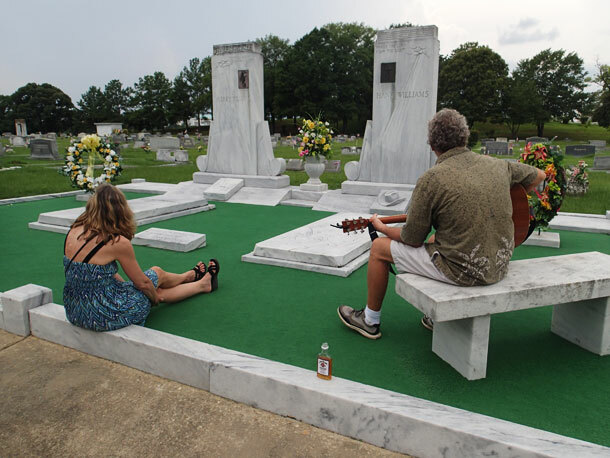 Greg plays a few tunes at Hank Williams’ grave site in Montgomery Alabama. 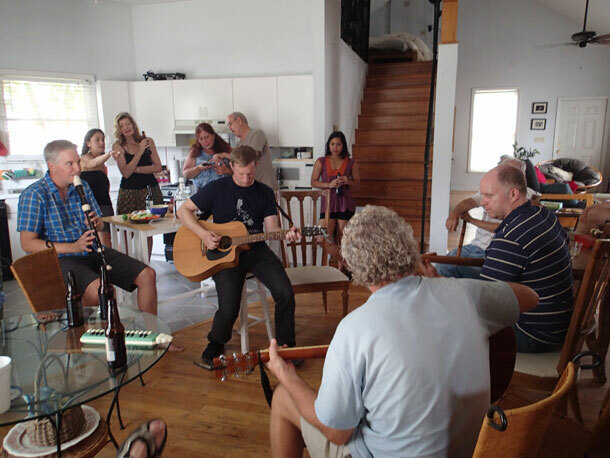 Jamming at Dr. James’ house. Cabbgetown threw a neighborhood wide yard sale. our friend Karen wanted to sell some things and shop at the same time. She solved her delimma by fill a wheel barrel full of her wares and carting it around the ‘hood while she purused the other sales. 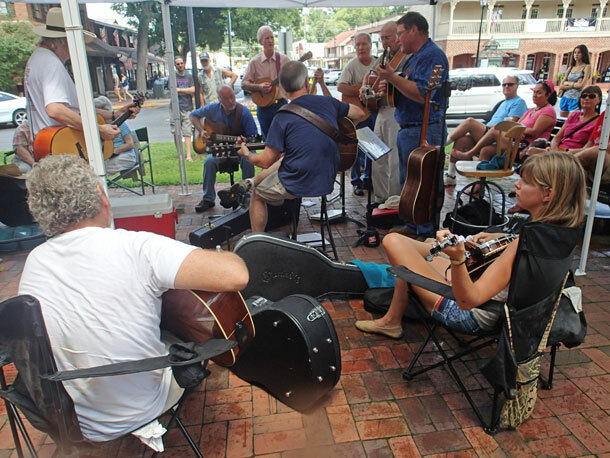 Ariadne, sitting right front, jams with the old guys. This entry was posted in Cabbagetown and tagged Cabbagetown. Bookmark the permalink. ← Back in the Bahamas!